As I drove down Rt. 495 in a recent slush/ice/snow storm I found myself behind plows throwing sand and salt. They do this thing where they stagger themselves in each of the lanes. It makes sense. They get full coverage that way. Unfortunately, cars can’t get by and you get not only their salt and sand in your windshield and off your hood, but the cars around yours also throw it up. The constant tick, tick, whack, of the bigger pieces bouncing off my windshield made me smile. You see, my "nice" was garaged. I was in my 7 year old Toyota Highlander and I was very glad that the car I baby was not having to be denuded of paint and glass that night. It made me think that my being in an old Highlander was no accident. 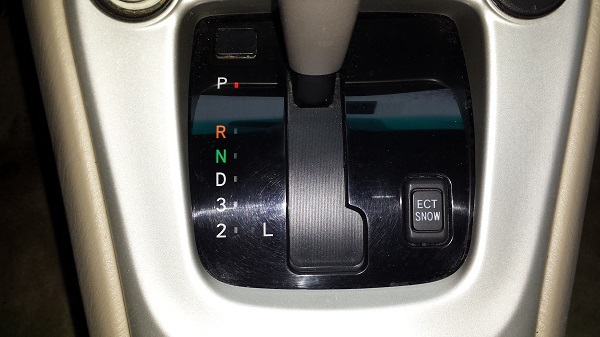 As the photo shows Toyotas have long had the cool “Snow” mode on their transmissions. This comes with the car regardless of cost and it is a very simple way to make a car go in the snow. All it does is start the car in second gear to reduce torque. It works great. My Highlander, like most that were sold mid-grade or above, also has the winter package that has heating elements at the base of the windshield to help melt ice and warm the wipers so they don’t get all frozen up when the weather starts to freeze the window washer fluid. These types of things are simple and very inexpensive for a car maker to add. Little things like that are what win long term customers. My Toyota also has winter tires. One thing that I love about that 2007 Highlander is that although it does have a tire pressure monitoring system (TPMS), it uses the anti-lock brake sensors instead of the much more expensive valve stems with their electronic sensors. So I was able to get cheap rims from Tire Rack and keep the winter tires on their own rims. In winter all I have to do is bolt them on. At that time the government had not yet mandated the ridiculous sensor based systems we now find on all cars. Toyota solved the problem (not knowing one has a low tire) affordably and effectively. The cool side effect was it made owning snows on rims so much more affordable and easy. No reprogramming and no stinger of a bill to add them to the second set of rims. There are other reasons Toyotas in particular age well into great winter beater cars. Toyota has the highest resale value for a reason. They break less than other cars. They also get the highest quality ratings of any automaker for that same reason year after year. That means if you buy an older one you might not have as many things to fix which saves you time and hassles. There are a lot of Subarus in my neck of the woods. I literally live in the woods, and there are literally a lot of Subarus around here. I had three Subies and I loved them - sort of - but they all needed an alternator before they hit 60 K, and one needed an engine at 11K miles. So there was a lack of karma between me and the Subies and we agreed to find other partners. I also felt that even the Outback was not really high up enough for me to see well over snow banks, which is a huge advantage of a RAV 4 or Highlander. I considered a B9 Tribeca from Subaru, but they came with very, very wide tires. Everyone knows that wide tires are bad in the winter, so I couldn’t pull the trigger on that model when I considered it years ago. If I had to give second place to a company for making great winter beaters I would pick Subaru. Toyota is a brand I favor, and that is not something I hide here at Torque News. Is there something wrong with being happy to be in an older car and wanting to tell people why?